Two year 10s approached me in the corridor. “Would it be OK if we set up a lunchtime Philosophy Club for the lower school?. It’s part of our DofE.” Would it be OK??? Just tell me what you need – whatever it takes. Year 9 Nurture Group IT Presentations. Four students for whom school is pretty challenging, stood up to dazzle the gathering with their wizardry; embedded videos, clever transitions and lots of great info relayed with real enthusiasm. It was one of those moments where the students’ pride and relief at overcoming their nerves brings a tear to your eye. The Year 7 ‘Engage’ assembly. 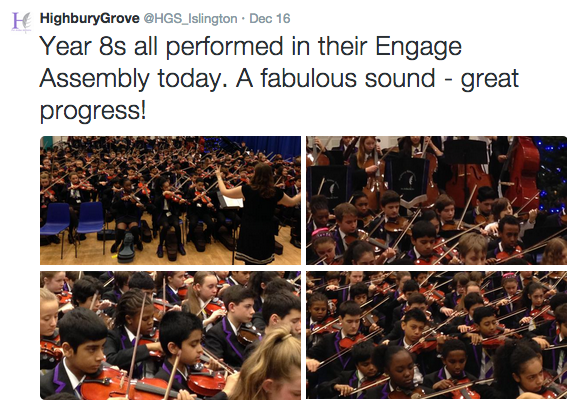 200 Y7s playing ensemble after a few weeks of lessons – and the next day, the Year 8s playing, one year further on. Magnificent. The Year 8 Library Quiz, held in front of the whole of Year 8. I just loved the fist pumps at knowing answers – Charles Dickens, Emily Bronte, District 12, Scabbers, Great Expectations….. It’s cool to know things you can find in the school library. Year 10 Computer Science GCSE. Josh explained how his programme for a timer took just a few lines of code but the graphical digital counter required a lot more as each bar of a digit needed a different sub-routine. He could not have been happier to be studying this course. Gita sent me a Christmas Card. 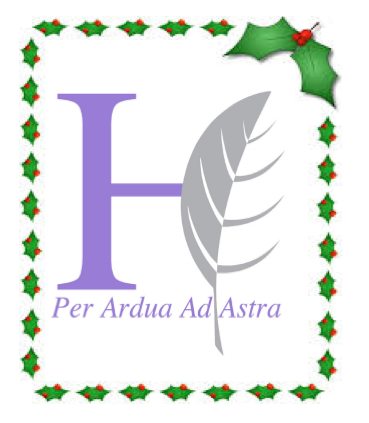 A lovely but unremarkable message of Season’s Greetings. But in brackets underneath – (PS Sir, I really like the C3 system; I haven’t had any detentions myself but school is SO much better.) How else could she tell me this? THIS is why we do it – for kids like Gita who just want to learn. A Year 10 English Lesson in the hands of an excellent teacher. Harmonium by Simon Armitage – a complex and confusing poem at first reading but laced with meaning and symbolic significance. An expert, extended Q&A exchange brought the students through to a level of understanding that yielded a cry of joy from the teacher. She stood in the middle of the room, arms outstretched: “Yes! Yes! That’s IT!. You’ve got it.” Brilliant. Ahmed again. After my assembly about the Hubble Ultra Deep Field and Carl Sagan’s pale blue dot, Ahmed stopped me in the corridor. “Thanks for assembly Sir. All those stars…..I never knew. It’s amazing”. I felt like I’d awakened something in him in a meaningful way. How great it feels to provide a moment of real enlightenment. Jake left a comment on my blog after an assembly about educational privilege and poverty. He was moved – and wanted to do something. He came to see me in my office. A Year 10 student with a sense that we should be taking this stuff more seriously; that we should act, not just talk – but not quite knowing how. We talked about a campaign to raise awareness and how he could get organised. This young man will go far. A Business Studies lesson with Year 12; students captivated, challenged, questioned with confidence and pushed forward with their learning. The teacher, a Teach First recruit, six weeks in, teaching like a pro. Not all his lessons go that well – ‘you should see my Y9s’ he said – but with people like this joining the profession, we’re going to be OK! Seeing young teachers grow is one of the greatest joys a Headteacher can have. « A Cultural Capital Christmas Carol? What a really heart-warming post- a great reminder of why working with young people is a real privilege! What a fantastic first term at HGS. Here’s to many more. What a heartwarming post, Tom. I’ve loved following your first term in your new school.